You have probably already heard the word “veneer” used in other contexts to describe a very thin covering that makes the surface of something look better. That’s exactly what it means in dentistry as well. An extremely thin custom-made shell that is astonishingly lifelike in appearance is placed on the front of a tooth giving it a new “face.” In order to make veneers look naturally contoured and harmonious, it may or may not be necessary to remove tooth structure, depending on how big the teeth are to begin with, as well as the desired final tooth size and shape. Tooth color can change throughout one’s life, generally yellowing with age and time. Some people who were given the antibiotic tetracycline in childhood develop tooth discoloration that is very difficult to remove, even with Laser Teeth Whitening. Also, the choices we make in consuming certain foods, drinks (especially red wine, coffee and tea), and/or cigarettes can affect the color of our teeth. Whitening can help, but the degree the teeth will whiten is dependent on the starting point. Some teeth with excessive discoloration never achieve an acceptable color with simple tooth whitening. 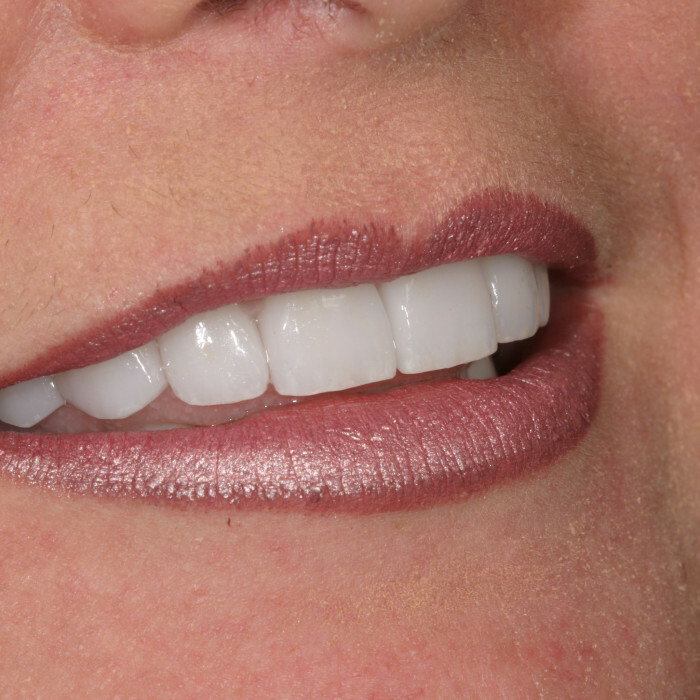 A porcelain veneer, however, has the ability to mask color and therefore provides greater latitude when making a color shift to whiter and brighter. Abnormal wear on teeth can make them appear shorter, flatter or rough along the edges. Younger teeth have rounder shaped edges. Therefore, veneers can give you a more youthful smile not only making the teeth whiter, and brighter, but also by redesigning them to incorporate the features that make them look more youthful. On the other hand, some people consider rounder teeth more feminine and might want the edges made a little squarer for a more masculine appearance. But that’s the great thing about veneers: it’s a collaborative effort in which you play an important part. Sometimes the only thing keeping a person’s smile from being all it can be is simply that the teeth are too small. Maybe they’ve always been that way or maybe they became shorter with wear, over time. Veneers can be used to make the teeth appear larger for a dramatic enhancement. Of course, if the teeth have been worn down excessively, it is important to address the underlying causes in order to prevent recurrence. Likewise, if you have lost a lot of tooth structure from decay or trauma, you might benefit more from porcelain crowns that cover the entire tooth and reduce the risk for future problems. A smile makeover is a true collaboration — between you and us. So the first step is to figure out what you feel needs to be changed about your smile. You should discuss not only the problems you would like to correct, but also the smile you would like to have. When you are satisfied that your dentist understands what you are looking for and the two of you have agreed on a plan, your teeth will be prepared for the new veneers. Tooth preparation varies from polishing the teeth to removing tooth structure from the front, biting edges or sides of the teeth with a dental drill. In addition to the starting condition of the teeth, the amount removed is dependent on the desired result, and position of the teeth; overall the goal is to remove as little tooth structure as possible. As we map out a plan to achieve the desired result, it is important to be clear about this part of the process before it begins, as tooth reduction is not reversible. Once your teeth are prepared, an impression (mold) of them will be made. This will be sent to the dental laboratory, where the technicians will use it to create an exact replica of your teeth upon which the veneers will be made. During the time the veneers are being made, which may take 1-2 days, you will wear a set of provisional veneers, also made of acrylic. These will be cemented onto your teeth and you will be able to go about your daily activities — chewing, speaking and of course, smiling! When the veneers come back from the lab, they will be physically bonded to your teeth in a manner so secure, it would take a dental drill or a laser to remove them. First, both your teeth and the inside of the veneers will be “etched” with a mild acidic solution. This etching process will open up tiny pores in both surfaces. The dentist then applies translucent cement that forms microscopic tags that fit into these pores. It’s a seamless “micromechanical” attachment that will essentially make the tooth and veneer one unit. What are the potential downside of veneers? Creating porcelain veneers requires some laboratory time, so expect at least a few days before they’re ready to be applied. Should I get porcelain veneers or composite resin veneers? Dental veneers are made from porcelain or composite resin. The advantage of porcelain veneers is that they resist stains better than composite resin veneers and better mimic the reflecting properties of natural teeth. However, porcelain veneers have a greater risk of cracking than composite resin, which is a harder material. Composite resin veneers require less shaving of the tooth surface before placement, however, and so are a better option for those with sensitive teeth.